IMTips.co is hosted on dedicated server by ThePlanet (See my Review for ThePlanet here) but the move I did was for my friend Yogin. His site is ManagementFunda.com where I am more of a tech guy. Yogin always told me that he is experiencing site as slow quite often but when I checked I could not see anything like that but that may be because I don’t spend hours on his blog like he does. I even tried chatting with the tech support team but then you can never get the chat people understand what you mean by slow. They will always reply they could not replicate your problem. Horrible control panel which is still a beta but their beta is not like other Beta you expect. Their control panel have their own File Manager where you cannot unzip a zipped file and for doing that you have to take some other path. I expect to upload a zip file using FTP and unzip using file manager. They have unzip option which is almost impossible to find. It is under some archive gateway. Techy things like archive can be dealt with if you have good support but I just saw a horrible support. As always I will show you some horrible replies by the support team once again. Site was down from 21st Jan, 2011. Once I saw my site down I started a chat and the person I talked with saw my site down and so he created a support ticket and you can see the details of the ticket here. 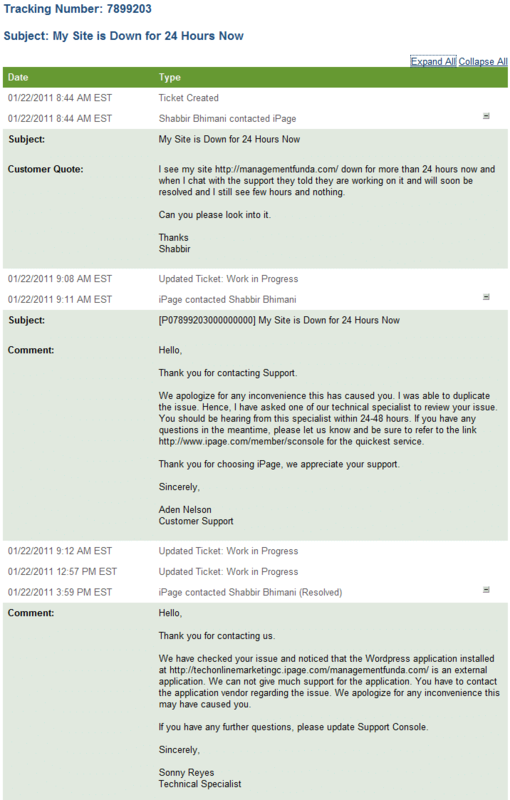 See the timing when I created the ticket and when it was resolved. On 21st Jan the issue started and it was resolved on 24th Jan 2011. Now this is not all. The actual comedy happens in the next ticket which I created few hours after I reported the issue through chat. You see in the first image that my site was down from 21st Jan 2011 and on 22nd Jan 2011 you see me creating a second support ticket and see the last response to the second ticket in the second image. They tell me that they cannot do anything because it is a WordPress site. Unless you opt to use any script supported by iPage (they don’t support any as far as I know) you should never be using them. BTW they provide WordPress and Joomla as a third party application and this is not what they mean by support. The person responding Sonny Reyes acts like everything is working fine for my site and it is just my WordPress installation that has the issue. The tech team have no idea if php is working or not for my site and the person who is replying has signature as Technical Specialist. Sorry Sonny and nothing personal against you. Once I got the message from iPage on 22nd I decided to dump iPage and started my search for other best shared hosting provider for WordPress. I wanted to go from my list of best hosts and once I saw BlueHost among the recommend hosts by WordPress.org itself, I moved to Bluehost. I don’t recommend iPage for WordPress (Read hosting) but use BlueHost instead for all your shared hosting needs. ipage is worse experience ever do not try it because they take your money and delete your account .They invented that you have a virus or malware and your site will down and you can not do anything about. I hear that Google does not like ipage and the site hosted there and that could be a bigger problem. I Will NEVER EVER thrust my files to Bluehost!! Moving 41 sites from that insecure place!! I have normal sites made with their tools and secure passwords but I was hacked and they don’t care… they say this is my problem and point me to the Terms of service! So, I going were they care for our files and it’s not so easy to hack as bluehost is!!!!!!!!!!!!!!!!!!!!!!!!!!!!!!!!!!!!!!!!!!!! I was a bluehost costumer since 2006. What was the CMS you were using by BlueHost because they don’t have any CMS of their own and provide third party scripts which when not used rightly can have issues. Even if you are using WordPress, you need to make sure you are using the latest version of the software and not using any plugins that are not upto date and things like those. Yeah, I know their Terms of service that’s why I am moving. I have really lots of CMS and I cant be always updating all. No time for that! So, I am moving to a web host were they can protect my files even if I cant be always updating my CMs. iPage can protect your files. But bluehost is really vulnerable I am having serious problems with a .htcaccess hack and blue host CANT or DONT KNOW how to solve. To void having all my sites contaminated I am moving from BH!! That’s why I hate them. iPage will not protect your files either and I know this for sure.If you cannot upgrade your CMSes, I really doubt you can be secured on any web server unless there is some option to keep them updated automatically. If you have decided to move to iPage do share your views about them as well. Now that I know both, iPages is far more secure and there is a way to protect .htaccess. iPage has Less menus but we dont need more. Great to see that but you can only say it is secured once you have been tried to be hacked and so I think we need to wait for few more days before concluding anything. For me, Hostgator, inmotion and bluehost remain the best. I have heard good things about arvixe as well. I’m using iPage for a half year now and haven’t seen any difficulties with them. Maybe because I\m using MY html, css, flash, php, whatever, and not 3rd party apps which might screw up ANY website… seriously guys… gimme a break! Is it. Why don’t you share your name and URL in the box instead of naming yourself as USER with invalid email? iPage is a worst hosting company i ever hosted. I host one of my site with znetindia and I thought they are the worst because my site was down for few minutes a day and for my new blog i choose ipage after reading few reviews over the interweb. I bought a test package of 1 year and was satisfied first few weeks..may be a month, there i made a mistake by buying 3 years package, and since last month my site is down atleast 4-5 times a day, the ipage support team says, itâ€™s an temporary issue because we are on shared hosting. 1-2 downs of few minutes per day is slightly acceptable but 19 times in 9 hours??? Would you believe? Today my site was down 18 times since morning 9 between 6.30am (while i was writing this comment site was still down). So planning to move to BlueHost please let me know howz the service? Are you satisfied? Hi Shabbir, I thought of introduce your readers one of best WP hosting i found lately. Site5 – where I moved after losing few bucks from the titled hosting company. My blog is now hosted by Site 5 and I’m really happy with their service. Itâ€™s almost a year I’m with Site 5 and I never ever had a single complaint on them. My site loads fast, uptime is 99.999% (guaranteed) and Support one of the best in Industry, I bet it. Navin, that is so nice of you to share your view about site5. LOL! Endurance International Group owns both Bluehost and ipage so I am willing to bet the support and server performance is going to be about the same. Its a news for me as of now but yes something really interesting now and it would be interesting to see what happens to the quality of service. Just like your friend, I was using BlueHost mainly to host some wordpress blogs. I don’t yet know if iPage will prove to be better than BlueHost in this regard, but I guess I’ll find out! I’d also be interested to hear your input concerning the link I posted above. I think there could be one such incident which is not handled well by BlueHost. Now when it comes to unlimited all web-hosts tell that but as a customer we have to understand that traffic of Google cannot be hosted on $7 hosts. At least I understand it that way and smaller sites when start to get more traffic they should be moved to a box. Good points. Thanks for the input, Shabbir, and thanks again for putting up this qualitative, honest review! I finally had time to set up a website on my recently purchased iPage hosting–mistake, mistake, mistake! iPage hosting is absolutely horrendous! 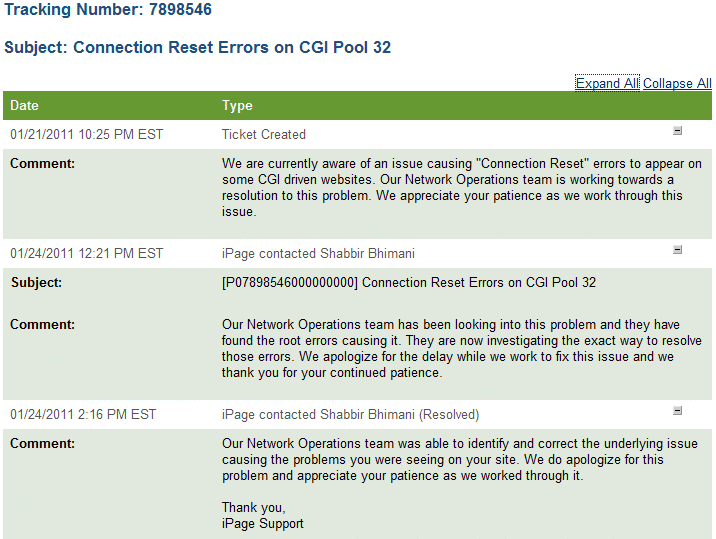 Man, Shabbir, you were right on the dot! I’m going to have to call up iPage for a refund and switch back to BlueHost. Can’t call method “disconnect” on an undefined value at /usr/local/atmail/webmail/libs/Atmail/Auth.pm line 50. For help, please send mail to the webmaster (support@ipage-inc.com), giving this error message and the time and date of the error. This is completely intolerable! iPage hosting wouldn’t even be worth it for free let alone the $42 plus all the time and headache it has caused me! It’s true that BlueHost costs twice as much for a year, but paying $42 for iPage hosting literally is akin to one throwing away their money in the garbage – actually, throwing your money away in the garbage would be preferable since at least in that case you wouldn’t get such a headache and waste so much time. I really do wish those host-affiliate SEO spammers would stop what they’re doing so others would be able to more easily find honest reviews like yours so they won’t make the same mistake I made by getting this pitiful excuse of a host, iPage! On the bright side, I learned a valuable lesson from this ordeal – that being not to expect paying less than $7 a month even for hosting just a small simple site. I didn’t manage to find your review until I had already purchased the iPage hosting plan, but I certainly hope others do find your review before they make the same mistake I made and end up wasting time and peace of mind trying to set up their website at iPage. Now that I’ve sufferingly experienced iPage firsthand, I wouldn’t host a website with them even if they paid me to host my site with them (yes, it really is that terrible!)! If I had to rate iPage’s hosting, I would rate them a zero out of five stars. I can say with certainty that iPage hosting is the worst hosting I have ever had to date. If anyone manages to see Shabbir’s review before actually buying iPage hosting, I strongly recommend to heed his advice and go with some other hosting like BlueHost or another host that is at least comparable in price to BlueHost ($7 a month)! Unless of course you’re interested in getting a headache and wasting time and money. Thanks again, Shabbir. Zero stars for iPage hosting, but five out of five stars for your review! Wow…I’m having similar issues that you were having! I’m actually looking for a new shared hosting sever right now and came across this blog. You can opt for BlueHost and I think it is one of the best shared host but because they don’t pay very high for affiliates they are not very well ranked on those so called web hosting review sites. 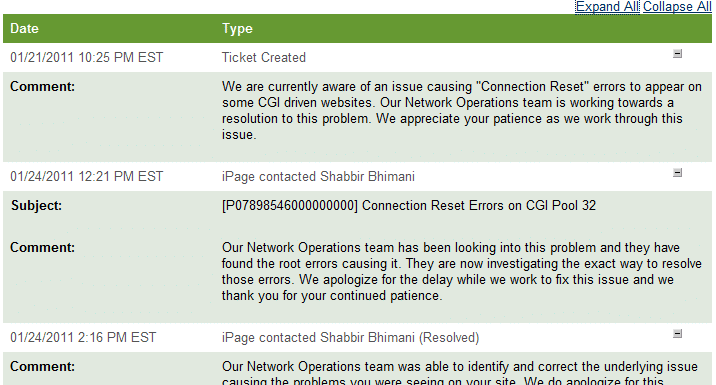 So lot True Shabbir, I had faced this issue a lot and really thanks to you and I do appreciate your patience to resolve it from so unorganized company like i-page..I hope nw I Don’t get any problems..